A schematic representation of the canine atrial myocyte. Intracellular compartments indicate the intracellular pools of ion species. The ion concentration in each pool is affected by ionic currents, pumps and exchangers. 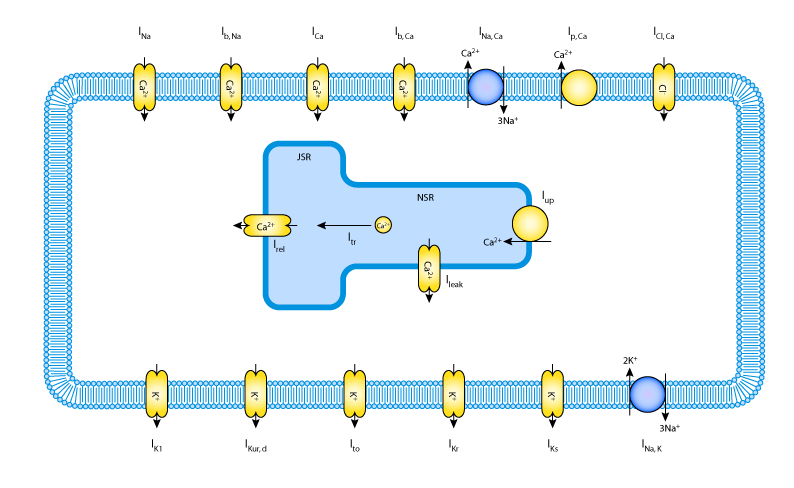 The sarcoplasmic reticulum is divided into two compartments: the Ca2+ release compartment, or junctional sarcoplasmic reticulum (JSR) and the Ca2+ uptake compartment, or network sarcoplasmic reticulum (NSR). Derived from workspace Ramirez, Nattel, Courtemanche, 2000 at changeset 2b863bc9d3b3.